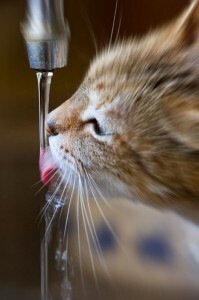 Cat would always perfur to drink water whether from a flowing water fall, kitchen sink or just a pond. Why? Because it is oxygenated, fresh, clean and purified. How many times have you seen your cat drink from the mention sources. So one needs to make their feline friend happy and well satisfied by purchasing a cat drinking fountain. I have seven cats and they all drink from the flowing water rather than just from the bowl. Most fountains for cats offer various flow rates and carbon filters to remove unwanted particles found in city water. Like you, you’ll be happy with purified water and your cat will say healthy, wealthy and wise.